Ang (front row, fourth right) in a photocall with guests and speakers after a briefing with community leaders. 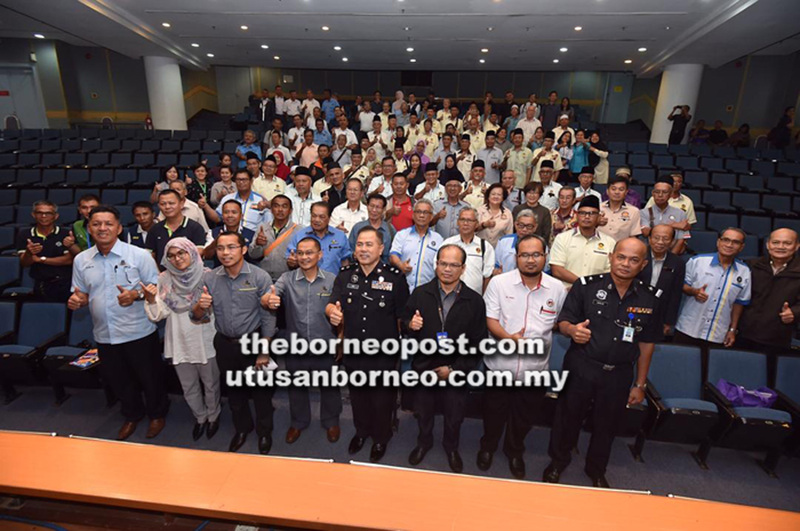 KUCHING: Twenty-two teams involving 330 personnel will be involved in the on-going integrated rabies elimination operation here (Kuching) from April 22 to May 3. According to the police Community Crime Prevention and Safety section head DSP Ang Seow Aun, the operation is one of many strategies employed to eliminate the rabies outbreak in Sarawak by controlling dog population and movement. It includes target removal of abandoned, free-roaming and stray dogs. “Another strategy is to enforce dog licencing, registration by-law and vaccination of owned dogs. “During the operation, the Veterinary Services Department will also conduct vaccinations. If people want to save RM60 from going to a private vet, they should not miss this opportunity to get their dogs vaccinated,” he told community leaders at a rabies awareness briefing at MBKS Auditorium yesterday. Ang lamented that despite all the efforts to provide free vaccinations, there are still many dog owners who do not bother. “These are people who let their dogs in at night to guard their houses and let them out during the day. They do not treat their dogs like family. Even though they can bring their dogs to the designated venue for free vaccination and get them registered and licensed, response is still lacking. “Maybe in 100 owners only five care to vaccinate and register their dogs. That is how bad it is,” he said. Ang hoped that the community leaders, who were present at the briefing, would go back to their respective communities and villages, and get the right message across to the people. He said community leaders have a very heavy responsibility to ensure the operation is successful. He said if there are any area that requires awareness briefing about rabies, the community leaders could contact the relevant authorities to arrange for it. time could get them penalised instead. “We want people to understand that we don’t just go and shoot dogs. There are so many strategies we can employ, if only the dog owners would cooperate and comply. “We want to reach a level whereby any dog or cat that is outside the house would have to be accompanied by their owners. “It is a matter of how we want to educate people so that they understand their animals need to be vaccinated, registered and accompanied by their owners when they are outside the house,” he said. The integrated operation involving multiple agencies was initiated after the rabies outbreak was declared a Level 2 Disaster, which means it is happening in more than one district within the same state. As of April 16, there were a total of 24,715 cases of animal bites, since rabies was first detected in July 2017. To-date there are 16 fatalities, and one victim still unconsciousness.